Potere al Popolo! (“Power to the People!”; PAP) is a coalition of left-wing parties, trade unions, and movement groups that was launched last December. Together these organizations are contesting the forthcoming Italian national election, with votes to be cast this Sunday. Italian governance turns – or, since the 1990s, has successively failed to turn – on “the stop-gap, designed to overcome immediate crises,” as David Broder recently put it. The likely result of this weekend’s election – a grand coalition of the socially liberal Partito Democratico (PD) with Berlusconi’s Forza Italia, as in 2013 – promises little change, once again. I first met members of Je so’ Pazzo (“I’m crazy to try”; JSP), one of the groups that initiated PAP, at their Naples building in mid-September of last year (when we spoke about JSP’s relationship with the city’s mayor), and again, over the first weekend of January, in London, as PAP launched their UK section. JSP’s decade-long growth prior the PAP coalition prioritized social rootedness over political reach. Here we explore the questions of how they built their movement infrastructure in Naples, and what risks they face in extending nationally into electoral politics. Joe Hayns: Before we talk about JSP’s practical work, and after that about PAP, could you give a sense of the political-economic conditions of the city and region in which JSP has developed? Je so’ Pazzo: In southern Italy, we actually never had big industries – there are some exceptions, like Ilva in Taranto, which is a very big steelworks, and in Amalfi there were shipyards, but since the crisis in 2008, they just started closing due to high costs of production and of labor. It can be more profitable for Italian-owned capital to invest outside Italy, especially in Eastern Europe, and this is whats been happening in Italy in the last few decades. In Italy, Milan, other big centers, capital has invested in finance, and services, with concentration. This didn’t happen in southern Italy – we say there has been a “certification” of southern Italy, because there are no longer any big productive units. Currently, local government is trying to concentrate on tourism and trade, with a focus on small businesses. This is a problem for workers as, most of the time, small businesses hire you with no contracts and you have no rights. We’re not talking only about only migrants – migrants and Italians. Young people like us work in small hotels, bars, restaurants, and so on. The problem that we have now in Naples is that there are lots of tourists and so we have the Airbnb phenomenon, which means that rents are rising. They’re very high in some areas in Naples. And the housing stock here is pretty bad, with the worst quality housing being given to migrants and to students. But we don’t have a big housing emergency like other European cities. it’s not like Berlin, or London, or Paris. We have a huge unemployment problem – that’s our problem now. I mean, not now – I think it’s been about 150 years [laughs]. JH: Your group, the group that became JSP, came together in 2008. Could you explain your organizational trajectory? JSP: We decided to occupy this place, after a long political process. The first group of comrades met in 2008. We had only a small room in a university. We still have it today, but at that time it was the only one. We could only have small meetings, and at night and on weekends, it was closed. We couldn’t host any kind of social activity. Before here, we had been meeting together for seven years, and we had tried a lot of occupations that all had failed. For two years, we rented a place. We had concerts, we had debates, but we thought that it wasn’t enough. As one of our candidates said in their first speech, we realized that we needed to change political strategy; we couldn’t wait for people to come to us, we had to come out from the underground and reach out to the community. The easiest way to meet and gather without paying rent is to occupy. We live just on fundraising. This is an illegal occupation. Having this place gave us the opportunity to come into contact with more people, and to set up social activities and workshops. By being in touch with local communities in this way we were able to start discussions about the problems that they faced in their lives, the demands they had that were not being met, and so we began to work with the community to meet these needs collectively. We don’t like to call our place a social center, we like to call it a “House of the People” – it’s an important political and cultural tradition, the Case del popolo of the PCI [Partito Comunista Italiano]. Their aim was to have a House of the People for every church in Italy; even in the smallest towns, in the center of Italy, in the mountains, the PCI had a “House of the People.” We want to build on that tradition, though also innovating it in order to adapt it to our current reality. Though we are also part of a national organization, called Clash City Workers, which is active in a few different Italian cities, JSP is based in one city, in Naples. JH: One of your bases is informally-employed younger people, another is students, and another is people who have migrated to Italy. Of course, people might be of all these groups. How does that social geography you’ve described relate to in-migration? Every bourgeois state striates the working class – citizen, non-citizen, those with and without rights, and so on. How have you related to this process, as you’ve found it in Naples and the south? JSP: Immigration does not have a long history in Italy – we have always been emigrants. A lot of Italians have emigrated to the UK, and I was born in the United States. All of the laws regarding immigrants and migrants have been approved in the last 10, 15, 20 years – it started in the mid ‘90s. There are differences between northern and southern Italy. Most of the immigrants that come here to southern Italy don’t want to stay here – they want to go up north, because they know they’re not going to get work here. Most migrants in southern Italy are undocumented, they are illegal, and so they do not work in the formal economy. Up north it’s different, as there has been migration to the North for longer. People are more “integrated” into the local community, though at the same time racism and anti-immigrant sentiments have become pervasive there. Many migrants in the north are unionized and in the South this is not the case. In southern Italy in particular we have a problem with illegal recruitment by gangmasters, a process which we call caporalato. This phenomenon is particularly common in the agricultural industry, where laborers are picked up daily according to demand by illegal middlemen, often connected to organized crime, who take a cut from the laborers wages. It is a system of recruitment that has existed for a long time in southern Italy. It is still very widespread and it is almost always illegal immigrants, but also legal immigrants, who are the victims. It is a highly exploitative form of labor. These workers work 12- or 14-hour days for 20 euros, or even less. Women are often raped or abused. Sometimes they are not allowed to drink, they have no food, they sleep in the farm, with animals, or in tents. This kind of work is often controlled by the camorra. Not by the big camorra, but by smaller families that control the territory – they are small mafia clans even if they’re not part of the bigger mafia families, involved in smuggling, drug trafficking, and stuff like that. This is a still a big problem in Italy. Because in southern Italy migrants are very often undocumented, it’s hard for them to even come in to contact with a trade union. What we and other activist organizations try and do is to go to them, maintain contact with them, try to provide the services they need, first of all, to become documented, registered, legal. That’s why we have an Italian school and offer legal assistance for migrants. We have another practice that we set up. We go to immigration centers to make sure that regulations are respected and that living conditions are humane. Most of the reception centers are privately owned, and most of the time are owned by people or organizations, that are, let’s say, somewhat sinister. A few years ago, it was discovered that many immigration centers in Rome were being run by the mafia – upon winning the contract, they would leave the people living in their centers without even the most basic of services, including food. This situation still exists in the South. JH: I can imagine that some Marxists, of a particular type, would criticize your relating with migrants, with unemployed people, homeless people, with students, rather than with the classic revolutionary subject, the industrial proletariat. We collectively read and discuss the classical texts of Marxism. We’ve read Marx, we’ve read Engels, Lenin, the works of Black Panther Party, all together. We even wrote a book together, which is a sociological analysis of the working class in Italy today. We analyzed the various sectors, the productive sectors, of the Italian economy – we analyzed how the make-up of the working class has changed throughout the years. Proletarian does not simply mean the worker who goes to the factory, arriving in the morning and leaving at six at night, because work has changed. Work has changed; people have changed; society has changed. When we have to make important choices – for example, what should our position be in relation to the mayor of Naples? – we think about Lenin and his writings. But we need to analyze these writings, and consider them in light of the situation that we’re in today – this is not Russia in 1917, or even Italy in 1970. It’s Italy in 2017. It is imperative, in fact, that we continue to carry out political praxis and analysis rather than letting ourselves be paralyzed in the same, endless theoretical debates that have been going on since Marx’s time. And if you don’t like it because it’s hard work or because it’s not “orthodox” – well, actually, we don’t care. If we continue to restrict ourselves to an unbending schema, we will only be able to talk to 20 people. We don’t want to talk to 20 people. We want to talk to 20,000 people, way more than that actually. We don’t think it’s helpful to adopt an attitude that views people who are not familiar with Marxist, Leninist, or other theoretical concepts with a patronizing eye. This kind of attitude is in fact extremely unhelpful, and naïve in its understanding of the world. JH: There are probably only a few words so empty as “people” – it’s almost algebraic, an x or y of political discourse. “People” in its right-wing variation can refer to something like a “national group,” with the various exclusions that nation-building requires. The more frequent progressive variation counterposes “the people” with “the elites.” But just because it is a flexible term does not mean it is meaningless or useless. The generic Marxist criticism, which at least initially applies to both of these senses, is that “people” masks class difference. At the very least, emphasis is drawn away from the “working class,” and indeed away from class as a contradictory social relation. You’re alive to this criticism – could you explain the politics of your use of popolo? JSP: Yes, a criticism that people make of us is that we use the word “people,” rather than “proletariat.” When we use the terms “the people” or “popular classes,” we don’t intend them to have nationalist connotations. What we want to convey is an idea of all the social classes that are oppressed in society, which does not only include the proletariat as it has come to be understood. What we take from the Black Panthers is the idea that revolutionary political activity should not focus only on the proletariat as traditionally understood, because this excludes, for example, the people – still, in most cases, women – who work only in the home, a kind of work that is not recognized as work and yet is fundamental for the survival of the capitalist mode of production. For us, political action is about getting people to realize that the sources of their oppression and exploitation are what they have in common – this is why we use the word “people.” We use these terms because there is a necessity for us to be able to speak of a unified political subject that is broader than a narrow definition of the proletariat, and to recognize that there is a subjective element to it. The bonds that held together the traditional industrial working class do not exist today in the same way – a worker is much more likely to move workplaces frequently, for example. We must work to form new social bonds, and the way to do that is to focus efforts not only in the workplace but also in the community. If we only work with a traditionally-defined proletariat, then we leave behind other sections of society, people who are suffering, who are oppressed, and also exploited. Our political work is about realizing the demands of everyone who is exploited, oppressed, and excluded. We use material analyses to help us understand how best to do this. But we also don’t think there is an easy or mechanical route to revolutionary change. We don’t lose sight of the ultimate goal of ending capitalism and we also don’t resign ourselves to waiting; our duty as communists is to work hard to meet the everyday demands of people who lose out in the capitalist system while also planning – studying, researching, experimenting – every day for its end. JH: In a recent piece Rosa Gilbert explains that PAP includes “civil society and student groups, housing and migrant struggles and radical trade unions such as the Unione Sindacale di Base,” plus various parties. Could you speak a little about the groups to which you’re relating through PAP? There seems an admirable realization of shared views and shared objectives from all sides – what are the points of agreement? And why not fully merge, given your shared program and, as it seems, political similarities? JSP: Within Potere al Popolo there is a broad range of different organizations. We view political work as having two fronts. The day-to-day work of providing services is one. This kind of work has to be part of a project which aims to solve these problems at their roots, rather than simply holding back the tide. As such, we want to aggregate all the forces we can to create an effective political organization, which can make an impact on political life at the institutional level. This is what we are trying to do in Naples, in terms of our relationship with the local authorities, but this is also what we are trying to do at a national level with Potere al Popolo. 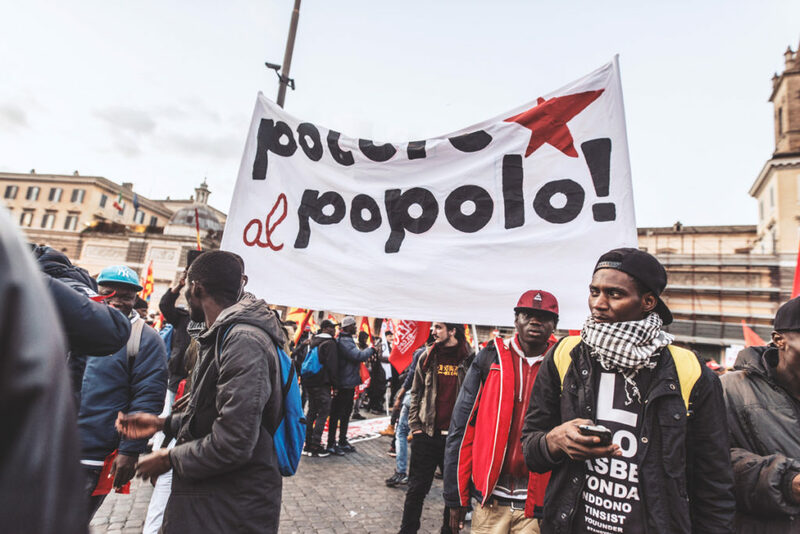 So Potere al Popolo is made up of social movements and organizations that work to build a social base for left-wing, anti-capitalist politics. There are groups involved in environmental struggles, there are social centers, there are workers’ movements and trade unions. Our aim is not simply to unite the various organizations active on the left, but to create a force capable of politicizing parts of our society that are not politicized, or that have turned to the 5 Star Movement or even to the far right. We are particularly keen to involve young people – 70% of young people will abstain in these elections. As to the question of merging, for the locally-based organizations, or single issue civil-society groups, this is not an issue, because they can continue to do what they do alongside the Potere al Popolo work, as ex-OPG – the ex-Ospedale Psichiatrico Giudiziario, the former secure psychiatric hospital where JSP is based – will, in fact. When it comes to the political parties, the first thing to say is that Potere al Popolo is an electoral list, not a political party. However, its principal objective is not electoral success, but the construction of a lasting national coördination of all the movements that have come together under the Potere al Popolo banner. There is no reason why this would require the formal merging of all the parties – what we are interested in is strengthening this coördination. JH: Lenin’s 1906 pamphlet The Social-Democrats and Electoral Agreements shows a great attention to the details of parliamentary politics – the rules governing it, the internal dynamics of parties, their relations to classes and their sections, and so on, 15 years or so before “Left Wing” Communism: An Infantile Disorder. The Bolsheviks knew the revolutionary potential of electoral, bourgeois politics, which have, of course, split, deformed, and otherwise changed communist parties – a history of those changes is probably one of the better single ways to understand the historical trajectory of communism. Is PaP strong enough to fight both elections and electoralism? JSP: We don’t have any illusions about the nature of the bourgeois state, or any illusions about what we can achieve in terms of a formal result at these elections. Our aim is to use the elections as an opportunity to create a shared national platform for the left, that can be transformed into a solid and long-lasting national organization. Part of what made us take this decision was looking at the situation across Western Europe, where radical left movements of different kinds have had significant success, both formally at the ballot box, but also importantly in terms of impacting on public discourse. Italy really stood out in that sense, with the prospect of an election campaign dominated by the right wing. On a deeper level, we think that engaging with the institutions of the state is a necessity. If we refuse to confront the power of the ruling classes, out of fear of being corrupted, we cede ground to them. We must face up to them on every front that they open up. This does not have to mean compromising on our autonomy – we must try to do this on our own terms. We have demonstrated here in Naples some very basic forms that popular control can take. We go inside the immigration detention centers; we organize outside the polling booths during local elections, as independent observers, making sure no irregularities were taking place; and we have carried out actions to make sure that the local labor inspectorate, responsible for ensuring workers’ rights are respected, was not engaging in corruption and collusion with exploitative employers. We have only just begun – any electoral result for us is basically a good result because we started from zero only a few months ago. But, success for us will be measured by many different means. Je so' Pazzo is an occupied social center in Naples, Italy, linked to the Clash City Workers collective. They helped to found the Potere al Popolo coalition.